LEN - www.lankaenews.com | Missing persons search begins after clearing obstacles placed by Mathri in much the same way as Mahinda ! 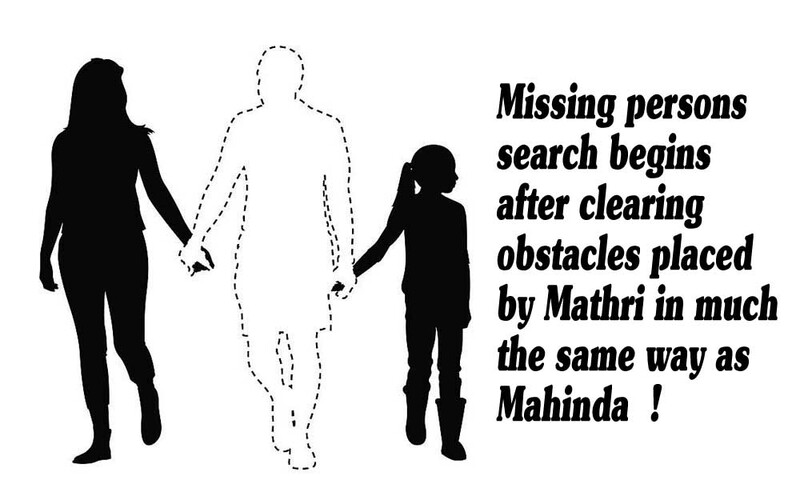 Missing persons search begins after clearing obstacles placed by Mathri in much the same way as Mahinda ! (Lanka-e-News - 06.March.2018, 4.45PM) The enactment to appoint the Office of Missing Persons (OMP) was passed in August 2016, in fulfillment of a main promise of the government of good governance. However , the appointment of Commissioners to run that office was delayed following president Sirisena’s pair of wheels going off track as of late – from good governance to racism . Consequent upon this despicable derailment of policies , the president did not appoint the Commissioners which was long overdue. ‘The facts and grounds searched and found by the OMP do not permit room for any criminal or civil court proceedings.’ Yet , Sirisena dubbed Sillysena because of his idiocy ,imbecility and silly racist proclivities , went on procrastinating for over 1 1/2 years to appoint Commissioners. In the budget 2018, a sum of Rs. 1.3 Billion was allocated towards this Commission, and its activities. Some had found fault for appointing a retired major General to this Commission , but let us remind them there were also over 5000 officers of the forces who went missing among the missing persons. It must be pointed out , minister of foreign affairs Mangala Samaraweera played a most vital and pivotal role in the appointment of this Commission , and made a huge contribution in that connection. My commitment to the struggle of the missing, goes back as long as my journey in politics. I recall a time in the 80s when cases of large scale disappearances were at alarming rates. The decision to devote myself to politics was driven by my concern with these atrocities that occurred around my hometown, and a strong desire to bring justice to those families suffering as a result of this. It may be the greatest irony that during those times I was inspired by the words of many individuals who championed the cause, including our former president Mr. Mahinda Rajapakse. He spoke fervently about our responsibility to find these missing people and to prevent such outrages from occurring in the future. I was struck by his moving words and his dedication to the cause and so began our journey for justice. In 1990 it was Mr. Rajapakse and I who were co-conveners of the Mother’s Front movement. This was a movement against missing children of the South and had a significant impact in setting the discourse surrounding this sensitive topic. Today, I am dismayed by the sentiments that he vociferously articulates, to tear apart initiatives that seek to alleviate the pain of innocent mothers of this country. The journey thus far has been long and by no means easy. A history of 30 years of violence is witness to the absolute necessity for the OMP today, perhaps even more crucial than it has been ever before. We have suffered through many conflicts from the time of the JVP insurrections in the 70s and 80s to the post-war violence just a few years ago. In these trying times, when the numbers of the missing have been steadily rising, few walked with us to see this journey to completion. The voices that spoke so passionately against these crimes suddenly started changing their tone. These same voices began switching camps so unexpectedly that lately many of the attacks on the OMP have been directed from Mr. Rajapakse himself. If the question of the missing still remains high on the agenda with the reported numbers of the missing rising each day, the question remains why it is no longer a cause worth fighting for. The answer is sad and simple. Self-serving policies and party politics have taken precedence over the suffering families of those gone missing over the past 30 years. For Mr. Rajapakse in 1989, this cause was worth getting arrested for at the airport while he carried documents with information regarding the missing to the UNHRC in Geneva, and today the same movement has been portrayed by this camp as an attack on our war heroes. The discourse has been distorted and manipulated for political gain, becoming a tool in the hands of power hungry individuals. Misconceptions have been drawn out to confuse the public and the victims of this have been none other than the affected families who have had no means to redress their loss. But make no mistake, this journey will not be ended by the selfish actions of these self-serving individuals. The OMP does not aim to benefit only one community and does not threaten another. It is merely a truth-seeking mechanism. It aims to investigate and find out the truth about those identified as “missing” or who have disappeared during conflict. According to the international Committee of the Red Cross, over 16,000 individuals have gone missing during the civil war. Of them, 5100 belonged to the armed forces. These are the very same individuals who fought against the terror that the LTTE created. We as a nation, have a responsibility to find the truth about where they are, and to bring an end to the agony faced by their families and loved ones. The OMP mandate cuts across all ethnic and religious boundaries. It seeks to investigate persons missing in connection with the conflict of the North and East and its aftermath. This includes those of all ethnicities; including the armed forces and police who have been identified as “missing in action”. It will investigate into those gone missing during political unrest or civil disturbances in the south as well as victims of enforced disappearances island wide. The mandate of the OMP ensures that it will carry out searching and tracing of missing persons, clarifying the circumstances in which such persons went missing and their fate, making recommendations to relevant authorities in order to reduce incidents of missing and disappeared persons, and identifying proper avenues of redress available to the families of the missing persons and informing them of the same. Despite its role as an investigative body, the OMP is not a law-enforcement or judicial body such as a court of law, and the Act clearly states that “the findings of the OMP shall not give rise to any criminal or civil liability.” The myths that have been spread about the OMP claiming that it is a witch hunt to prosecute our war heroes is a lie. The OMP cannot prosecute perpetrators of violence. These rumors are political manipulations to deter the fair and just actions taken by the government towards peace and reconciliation. It is merely an office set up to address grievances of the families and friends of those gone missing during conflicts and to ensure fair treatment for them in the future. The OMP gives the chance for renewed faith and hope for those who have lost their families and friends. It is not limited to an area or ethnicity but promises dignity and prosperity for all. These steps will prevent isolating and radicalizing aggrieved communities and avoid new forms of terrorism that can shake the peace and stability of our nation. In 2015 the coalition government vowed to develop a culture of consensual politics. The OMP took into strong consideration the recommendations made by the general public and civil society groups. Families of the affected voiced their concerns and ideas on the best ways to improve the OMP bill. Today their voices have been heard. Accordingly, the OMP is ready to engage with all groups, irrespective of their ethnicity, religion, or geographic location in order to get their valued input and information. The decision to do so was demanded by the people. At the UNHRC in 2015 I stated that our political change was bringing an end to short-sighted policies and a triumphalist approach to the end of the war. The OMP is the primary example for this promise. This independent body is set to continue its investigations despite changing government interests. It is an autonomous, transparent commission acting independently to any political biases or affiliations. This multiethnic island is one step away from lasting peace and prosperity. We as citizens of this great country must take this step together. We have made it through the difficult times. We have endured adversity in all its forms and we are here today looking forward to a better future.